Please consider General Growth Avoids Chapter 11 . General Growth Properties Inc., struggling under a mountain of debt, said Monday that its latest effort to win a reprieve from bondholders had fallen short. Under normal circumstances a company with as much past-due debt as General Growth would have been forced into Chapter 11 bankruptcy protection by now. Creditors so far have been willing to let deadlines pass because they believe there is little to be gained and much to be lost through a bankruptcy. "This is really rare," said Kevin Starke, an analyst at CRT Capital Group LLC, a research company that tracks distressed securities. "It is corporate-bond limbo like I've never seen before." 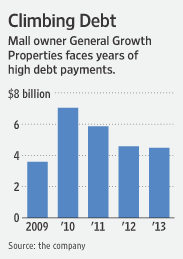 Many creditors say that General Growth's management is doing a good job running the company. Its 200 U.S. malls, a portfolio second in size only to Simon Property Group Inc., generate enough cash to cover interest on the debt. But its properties are overleveraged and it lacks the borrowing capacity to retire those debts as their principal comes due. "There's no question that General Growth is a liquidity issue," said Jeff Spector, an analyst with UBS AG. "The properties, for the most part, aren't broken." My Comment : Jeff Spector, UBS AG analyst is dead wrong. This is not a liquidity issue. This is solvency issue. The properties are indeed broken. They are broken by debt. There is more debt on those properties than can possibly be paid back. No one will possibly buy them for the amount owed. And every day that passes the value of those commercial properties sinks. Bondholders are only delaying the inevitable. General Growth, based in Chicago, isn't the only real-estate borrower that is getting a reprieve from its lenders these days. Hundreds of property owners have had loans come due without a repayment made in recent months. But most lenders have agreed to extend loan terms, hoping that the credit market will improve. Australian shopping-center owner Centro Properties Group, which owns 650 U.S. open-air shopping centers, last year sought one short-term extension after another. Finally, in December, after nine extensions, it averted a liquidation by agreeing to eventually grant its lenders 90% of its stock in exchange for two and three-year payment extensions on $7 billion of debt. My Comment : Boom, just like that, Centro lost 90% just to get a debt extension of 3 years. To be sure, General Growth may still be forced to seek bankruptcy protection soon. Trying to dig out from under $27 billion in debt, the company until this month has had the relative luxury of negotiating primarily with dozens of banks on more than $4 billion of past-due debt and debt that could become due because of other defaults. General Growth became even more vulnerable after a March 16 deadline passed for repaying $395 million in bonds. Now, rather than dealing only with several dozen banks holding past-due debt, General Growth must negotiate with hundreds of bondholders. Some holders bought the bonds at face value and are hoping for a recovery. Others bought the bonds at depressed prices and might want to force a liquidation to receive a quicker payout. My Comment : Any bondholder hoping for recovery is delusional. On Monday, General Growth said that it concluded efforts to get holders of $2.25 billion of bonds to grant it a nine-month reprieve from paying principal and interest on those bonds. It had three times extended the deadline on its so-called "consent solicitation" because not enough bond holders signed up. In exchange, General Growth offered the bondholders quarterly payments of 62.5 cents for every $1,000 of bonds, with interest accruing. But that offer wasn't accepted because many bondholders were unwilling to forfeit their ability to demand immediate payment for nine months, these people said. The result is an unusual situation in which borrowers have allowed the due date for corporate bonds to pass without the issuer either paying them or filing for bankruptcy protection. Often when a company defaults on corporate bonds, bondholders will force an involuntary bankruptcy petition. A person familiar with the bondholder talks said that, while some creditors are angry, none appears ready to insist on an involuntary bankruptcy petition yet. It is possible that bondholders didn't go along with the consent solicitation primarily because they feared that making such a pledge would reduce the value of their bonds. The lenders are hoping that the credit market will improve. I have news for them: It won't. Moreover, even if credit does free up, what is the likelihood that General Growth Properties can meet their debt schedule? The value of that property is sinking every day while debt due and interest on the debt due is rising every day. No lenders will refinance if the debt exceeds the value of the property. Therefore, bondholder hope for improved credit conditions is moot. A forced bankruptcy is coming either sooner or later. Many regional banks are at risk over ludicrous deals like this. Indeed, huge writeoffs are coming, not just on this property but on countless commercial real estate properties. What ridiculous mark-to-fantasy values are the creditors placing on this debt anyway? Creditors' reluctance to force bankruptcy suggests far too much. However, the debt clock is ticking and creditor patience is not unlimited. There is a time limit on limbo. I suspect we are going to find out what that limbo time limit is sooner, rather than later.